The latest episode of A&E's hit show "Duck Dynasty" played on the largest TV in the world on Wednesday, as Texas Motor Speedway unveiled its new "Big Hoss TV." That same episode also reached the least amount of viewers the show has ever had, continuing a decline from last summer's high point. "If you told me we were going to do this a couple years ago, I would've never believed it," Willie Robertson, "Duck Dynasty" star and CEO of Duck Commander, said in an interview shown on the screen. "I hope we look good." The 12-story Big Hoss TV, built by Panasonic, measures 20,633 square feet (94.6 feet tall and 218 feet wide) and costs $40 million. It has been designed to stand against winds up to 130 miles per hour, and the strength of the LED bulbs were tested by having golf balls hit the screen, simulating hail. ANI News reported that the TV, larger than Boeing's biggest 767, is set to make it to the Guinness Book of World Records as the largest TV in the world. The TV's size has caused some concern among professional race car drivers, that it might distract them on the track. "The good news is that it's so fast on the back straightaway that it would be hard for us to try to look," said Helio Castroneves, a four-time Verizon IndyCar Series winner at the Texas Motor Speedway. Castroneves is scheduled to participate in the same race on June 7. "Hopefully when we come back here in June, I can see myself in the victory circle on that big TV." The Big Hoss unveiling featured "Duck Dynasty" in part because Duck Commander, the company at the center of the show, is sponsoring the NASCAR Sprint Cup race at the Texas Motor Speedway on April 6. The show has also been a tremendous success. E! Online reported that CNN Money estimated the show's net worth around $500 million in January 2014. "I think a big part of it is because it is about family, Korie Robertson, Willie's wife and business partner, said in the interview broadcast on the Big Hoss. "People are looking for a show that they can sit down and watch with their kids and really come away from it and feel good. I think that's what 'Duck Dynasty' is about." 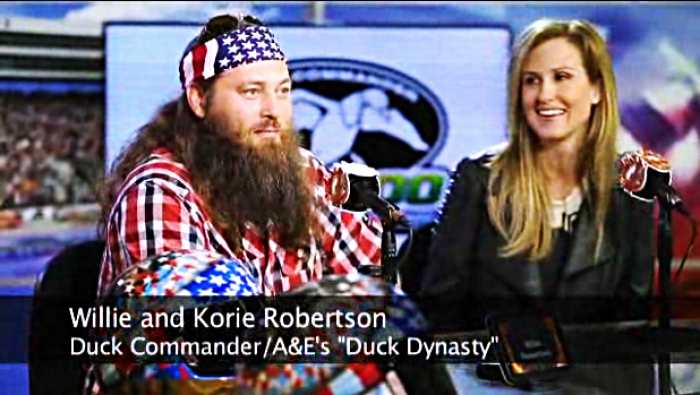 Both Willie and Korie also appeared as themselves in the recent film "God's Not Dead," sharing their faith to a television reporter. Willie Robertson testified that the film inspired him and strengthened his faith, in an earlier interview with The Christian Post. "Duck Dynasty" episodes end in prayer, and "God's Not Dead" finishes up with a song from the Newsboys, which Robertson praised as an excellent ending. Despite "Duck Dynasty's" great success, its ratings have been steadily declining since last summer, when it set new records with 11.7 million viewers. The Hollywood Reporter noted that the most recent episode, which aired on TMS' Big Hoss, set a new low for the series. "Wednesday's Duck Dynasty averaged 4.7 million viewers, the first time in over a year that the series has fallen below the 5-million mark." Despite the lower ratings, the show has remained as Wednesday's top cable program.